Is it possible to make a delicious, info flavorful soup with only 6 ingredients? I think so. And I think this might be my new favorite soup. I know I say that in almost every post, but this one’s just so good! And so easy. 6 ingredients, one pot and 30 minutes. Besides, it’s covered in melty, broiled cheese. Who can resist that on a cool day? No one! I’ve actually been avoiding the kitchen since Thanksgiving — those 48 hours of cooking and standing and cleaning kind of took it out of me. So, instead of my usual weekend in the kitchen, I spent my time off putting up our Christmas tree, riding my bike in the Everglades (down a bike trail lined with real, live Gators! ), and reading on the couch. It was fabulous! So, I’m trying to keep it simple this week. Nothing fancy, or roasted, or braised. I’ll save that for the weekend. This soup is deceptively simple, but tastes amazing. 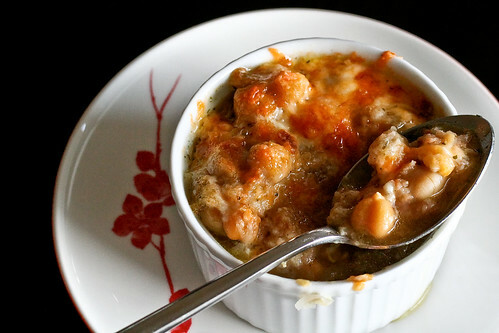 It’s like a French Onion Soup with its bread and onions and melted cheese, but the toasted chickpeas add a meatier, heartier flavor. This simple soup is really scrumptious and just perfect for a lazy dinner and a cold nigt. Set a large, heavy pot over medium heat and add 1 tbsp. of olive oil. Saute the onions for 10 minutes, or until they’re soft and almost brown. Remove the onions to a bowl and set aside. Add the rest of the olive oil to the pot, then the chickpeas. Toast the chickpeas until they’re golden on all sides, about 20 minutes. Resist the urge to stir them too often, or they won’t toast well. You should hear the chickpeas popping in the heat. Give them a good stir occasionally to make sure they’re not sticking, but don’t worry too much if they do. Once your chickpeas are golden and toasted, add the stock, using a wooden spoon to scrape any chickpea residue from the bottom of the pot. Add the onions back into the pot and simmer for 5 minutes. Stir in the bread. Ladle the soup into oven-safe dishes or small pots. Sprinkle each one with cheese and place them under your oven’s broiler for 5 minutes, or until the cheese is melted and browned. Remove carefully and serve immediately. Makes 4 big bowls of soup. This looks delicious. It’s gloomy outside… this may just be what I need to warm my spirits. Thanks! This looks and sounds terrific. I really like your blog, btw. I think it’s because we appear to have the same taste buds. Yum. That sounds perfect. I bet we could use the Thanksgiving turkey broth for this, too. This looks amazing. I’m in love with garbanzos, so this will definitely be a meal this week. Thanks. This is on the menu for dinner tonight. Can’t wait to taste it! I’ve been searching for some bread soup ideas to use up a stockpile of bread I’m amassing. This sounds perfect! We made this soup for dinner last night — absolutely delicious! And just perfect for a blustery rainy night. I topped the bowls with white cheddar….I am having a Pavlovian response just right now, as I type this. Thanks, useful content. Helped me write some posts on celebrity jewelry. Added your article to my favorites. Thanks for that, and for any readers that are having trouble chopping onions without the crying, here’s an incredibly easy tip – put them in the fridge first, then chop them straight away after taking them out! No more tears! I found some more onion soup recipes here if anyone wants to try some more recipes.